In 2016 we celebrated our Jubilee so it was time to refresh our vision, mission and organisation plan – to ensure that we can continue to innovate and provide high quality support and education to disabled children, adults and their families for years to come. We are very proud of what we have achieved over the past 50 years and of our distinctive characteristics that have defined everything that we have done during this time. These characteristics are now defined in MacIntyre’s DNA but in 1966 they were defined in our founder, Ken Newton Wright’s, visionary belief of the “learning potential of people with learning disabilities, their value as individuals, their right to equality and their importance to society”. We will support a sense of wellbeing through a celebration of each person’s unique gifts, talents and contributions, the quality of our relationships and ensuring the promotion of real opportunities to connect with others. MacIntyre’s primary purpose is to make a positive contribution to the lives of children and adults with disabilities. We make this contribution by ensuring that all our interactions are great, that our knowledge and skills represent excellence and that we support people to develop purposeful and warm relationships. Our secondary purpose is to have a positive influence in our local communities and on our sector by connecting well, nurturing partnerships and demonstrating best practice. Central to MacIntyre’s DNA (the way we do things) are a set of Promises. 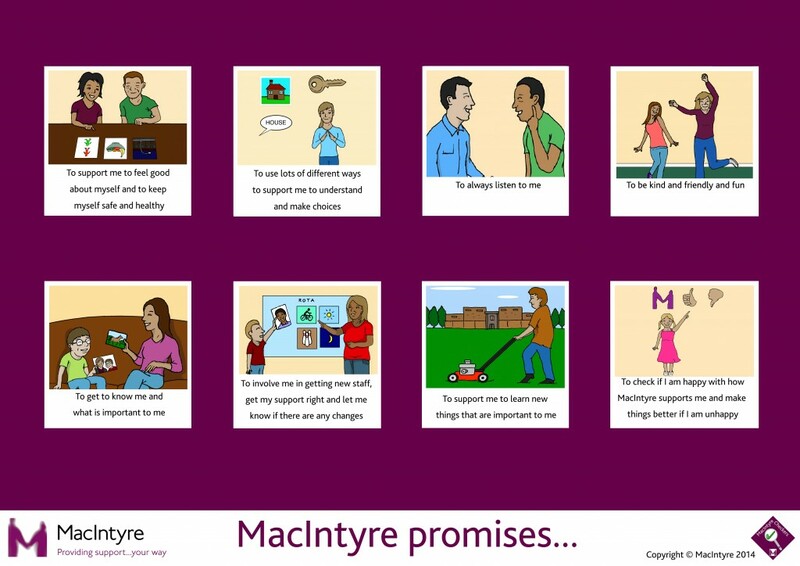 Each Promise sets out what a person supported by MacIntyre can expect and more importantly what they can hold MacIntyre accountable for. This way there can be no confusion as to what every child and adult who connects with MacIntyre can expect from us. The promises as set out below were developed by people we support over a series of workshops and they are now fully embedded within our DNA. Each person we support will give feedback on how successful we have been at keeping these Promises at their person centred reviews and this feedback will be collated and fed into our quality framework.